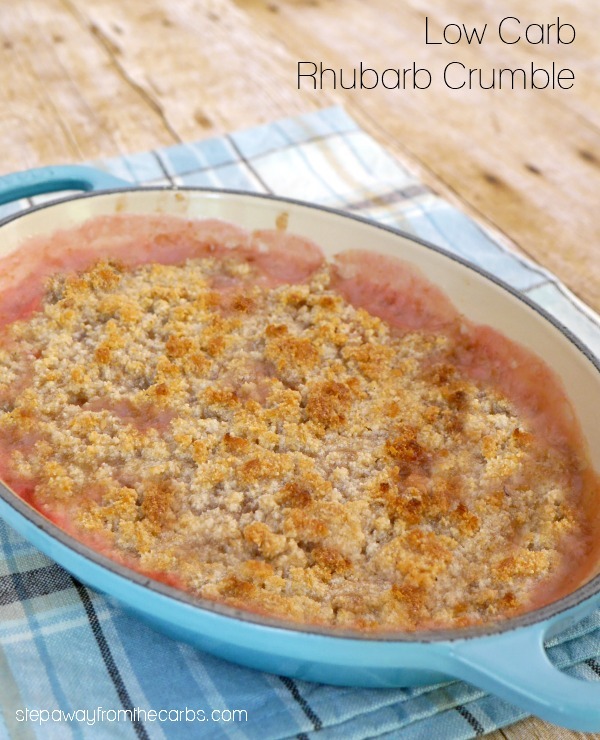 This low carb rhubarb crumble is a lovely dessert that will finish your meal off perfectly. Sugar free and gluten free recipe. 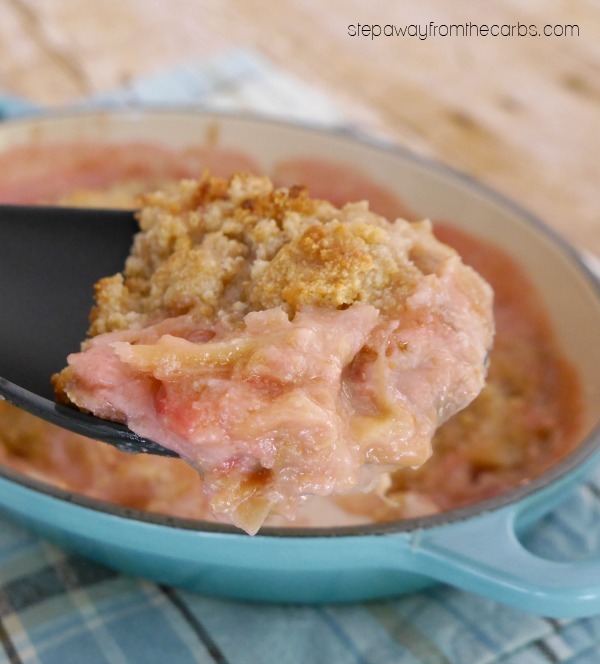 Rhubarb crumble is one of my husband’s favorite desserts. Ever. He isn’t following a low carb diet but is certainly happy to give my creations a try. This one definitely got his approval! To make the base, roughly chop the rhubarb and place it in a saucepan. Add a little water and your sweetener of choice. As this is going to be cooked I go for something granulated like xylitol or Swerve. How much you add will depend on your personal taste and how sharp your rhubarb stalks are. I’d recommend adding maybe a teaspoon of sweetener, cooking the rhubarb until it really starts to break down, then tasting again. Meanwhile, make the crumble topping, by adding almond flour, flaxseed meal, more low carb sweetener, and butter to a bowl. 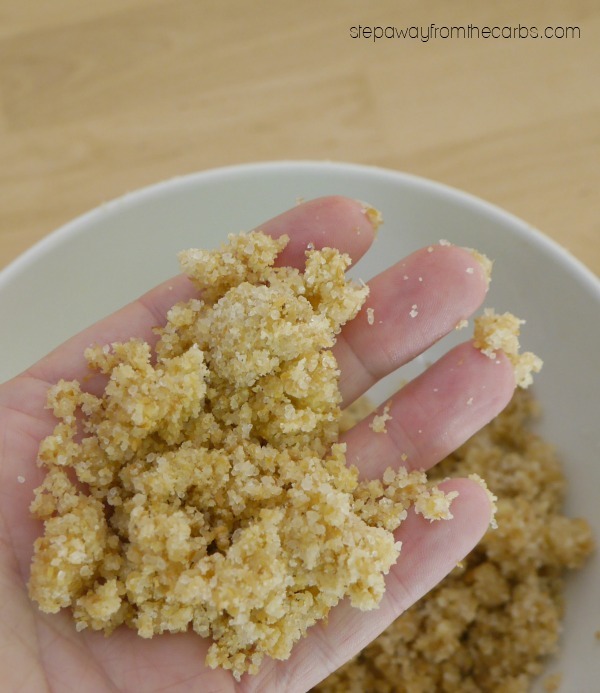 Using your hands, rub the ingredients together until the mixture forms large breadcrumbs. It will take a few minutes but it is quite satisfying work! Once the rhubarb is cooked and with the right sweetness, transfer it to a small baking dish. Spread the topping evenly over the rhubarb. Don’t worry of it doesn’t cover the rhubarb completely as it is very pleasing to have little pockets of rhubarb bubbling up through the topping! Place in a preheated oven and cook for 15-20 minutes. What an amazing smell! Divide into four serving dishes. This dessert is great on its own but some low carb vanilla ice cream would complement it very nicely too! 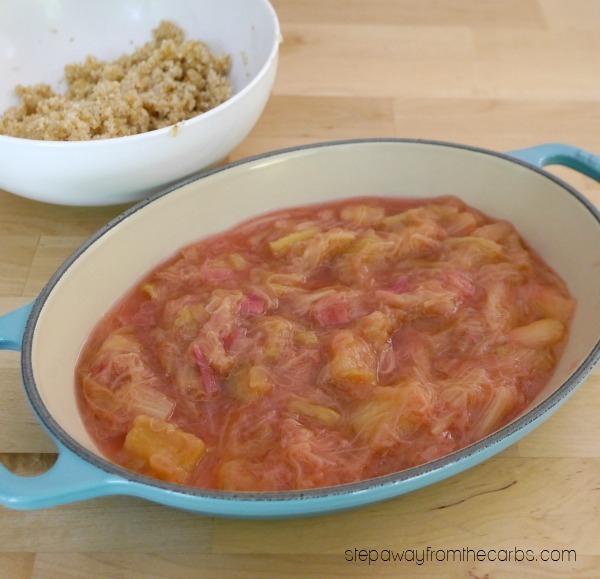 Add the rhubarb, sweetener and water to a saucepan and simmer until rhubarb is cooked. Meanwhile, make the crumble topping by rubbing together the remaining ingredients until they are the size of large breadcrumbs. Test the rhubarb for sweetness and adjust if necessary, then it over the base of a small baking dish. 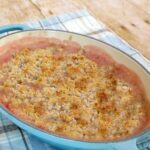 Sprinkle the topping over the rhubarb and bake for 15-20 minutes or until golden brown on top and the rhubarb is bubbling through the topping. My rhubarb is already cut into pieces. Was wondering if you could tell me approx how much in cups that 6 stalks would be. Weigh the rhubarb and then work out how many cups you have. One cup = 240g or 250 g depending what size cup you use. So if you have 500 g of rhubarb, you have 2 cups and a bit. 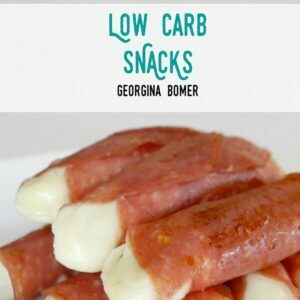 I love many of the recipes but there is never any macros listed. 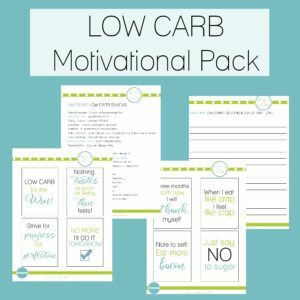 6.6 net carbs is not enough info. What is the serving size? Any protein/fats. I am hesitant on buying any recipe offers because i will have great recipes but missing serving sizes and macro listings or they list macros in percentages (Not helpful either). It does look good! 8×8 would be perfect, Sarah! I just made this – I think I didn’t use enough rhubarb if I needed 4 c. – that would mean more than 8 stalks that aren’t real big yet. I added 2 Tbsp. ripe cherry concentrate to it and a little water, It tastes fantastic, but next time more rhubarb! Anything to avoid sugar in the diet! !